The First Christian Church of River View was organized June 15, 1897 and was originally known as the Church of Christ or the New Testament Church. Rev. J. A. Branch was the prime leader in its organization. An old book exist, probably the first book of recordings of record, that records the names of members. In this book, the mens names were recorded first and the women second. Possibly, as was the custom of early churches, the men sat on one side of the church and the women on the other. The building housing the present day church was built by West Point Manufacturing Company ''The Mill Company" as a Union Church to be used by all faiths. The Christians, Methodists and Baptists worshipped on alternate Sundays. All faiths met together for Sunday Schools every Lord's day. As memory has it, there was no organized church until this time. Until the Union Church was built, meetings were held in the homes of believers. Today, the church building is listed on the register of historical buildings by the Chattahoochee Valley Historical Society. The Baptists were the first to build their own building. Years later, the Methodist built their own building, both churches are located on California Street. 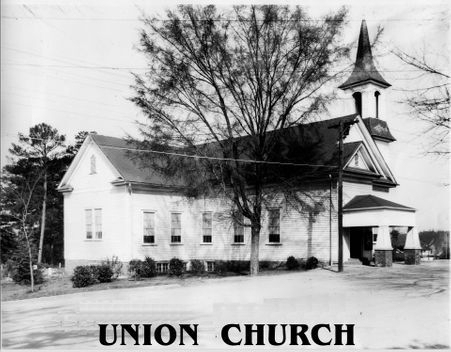 The land on which the Union Church was built was formerly owned by James Campbell and his wife, Ann, who deeded the land to the Alabama & Georgia Mfg Co. January 1, 1868. The First Christian Church of River View secured the Union Church building from West Point Manufacturing Co. August 25, 1948 by Warranty Deed. The original deed contained a covenant or restriction stating "that said property shall be used for the purpose of divine worship and for no other purpose." On November 26, 1958, a Quit Claim Deed was issued to the First Christian Church, its Elders and Deacons by West Point Manufacturing Company removing this restriction. The building and God's world has undergone many changes since 1870. The village, then known as River View was incorporated along with Fairfax, Langdale and Shawmut into what is now the City of Valley. The building was originally heated by a "pot-bellied" stove and lighted by six double wick lamps that hung from the ceiling. Only one of the lamps still exists today, and is preserved in the church archives. The church building has served as a school on two different occasions in past years. Once around the turn of the century, and again in 1926 when the school house burned. The church was used as class rooms until a new school was built. Curtains were used as class room partitions in the sanctuary. Through the years, several renovations have taken place to better serve the Lord and his ministry. A large part of the roof was blown off during a storm in 1901. A new roof with a steeper pitch was built above the old one. Today, there is a portion of the old roof still in the attic. There are no records to establish the exact date of the addition of the wings. However, in conversations with some church members who remember the additions and changes, the time period is somewhere between 1920 to 1928. At the time, Mr. T. J. Goggans was Superintendent of Riverdale Mill a division of West Point Mfg. Co., who at that time owned the church and did all repairs. The late James Christian said that Mr. Goggans noticed the original building was too small and too crowded so Mr. Goggans ordered Melvin Smith, Master Mechanic at the mill to add wings on the north and south side of the original building that added approximately 1,040 sq. ft. The floors in the new wings were elevated about one foot at the back. The purpose of the elevated floors was for those people in the wings to see over the heads of those in front of them. Where the wings connected to the original main building, large wood folding doors, with glass, were installed. These doors could be closed and used as Sunday School rooms, or opened for worship services. During this period, underneath the north wing was excavated and made into a boiler room with a coal fired steam boiler. Steam radiators were installed throughout the building. The "pot-bellied" stove was replaced by central steam heat. The boiler burned coal and had to be hand fired. The janitor would go to the church about 3 or 4 a.m. to build a fire so the church would be warm when it was time for church to begin. In 1921 or earlier, one man took the job of going to members' homes on Saturday to collect money to help pay the preacher -- the preacher always got paid! A second major renovation took place between 1938-1941. Rev. O. "Jake" Highsmith was the minister. The area underneath the north and south wings were excavated. A concrete floor was poured, exterior brick walls constructed, windows installed and Celotex ceilings were installed. This newly created space was used for much needed Sunday School rooms. The walls at this time were not stationary, but portable partitions that were used to separate class rooms. A drive was cut from the south wing out to the road -- now called Myhand Street. At this time, an automatic stoker was added to the boiler, eliminating hand stoking. A masonry baptistry was built from the ground floor in the newly excavated area and extended to the proper height in the sanctuary. Before this time, baptisms were performed in the branch east of the cemetery where cattle were dipped for ticks, etc. Access to and from the different floor levels was provided by stairs on each side of the baptistry. Rest rooms were also placed on each side of the baptistry downstairs. The clear rectangular glass windows in the Sanctuary were replaced with purple hammered glass windows with half-circle tops -- sometimes referred to as cathedralized. The purpose of installing the purple hammered glass was to prevent people inside being distracted by looking out, and those outside from distracting those inside, by looking in - especially the children. The pine floors were covered with finished oak flooring that is still in use today. A cathedral ceiling was installed. Celotex was placed on the walls and ceiling. The chandeliers presently located in the sanctuary were installed at this time and donated by Arthur and Mollie Newton. Even though these chandeliers are fifty-eight years old, they are still just as beautiful as the day they were bought and still work perfectly! During this renovation period, worship services were held in the gymnasium across the street. In the 40's and 50's, the First Christian Church of River View had a very large and active membership, both in local and state functions. Much was accomplished during this time; however, in the late 1950's, there was a difference of opinions that resulted in approximately sixty people forming what is now known as the Friendship Christian Church. This was the cause of much heartache! Families were split, feelings were hurt, and much misgivings that was very sad for all concerned. Both congregations have survived; and, at the present time, both are still very much active. Many members of both congregations have been lost to death and other causes. These lost members have not been replaced with new members; therefore, both congregations have suffered. The third renovation began in 1956 and ended in 1958. Pat Williams, a contractor for many years was hired to supervise the renovations. Again, much of the work was done by our own church family. Elder, Earl Leak had many years experience in the machine shop and was able to secure a leave of absence from his job with West Point Manufacturing Company to help with the supervision. Some of the work was done by sub-contractors Mr. Williams hired, especially the big jobs. One such job, among others, was moving the steeple from the north side of the roof to the center of the roof. Renovations began with the area that is now the Fellowship Hall. At that time, the area was class rooms. Joining the Fellowship Hall, underneath the northeast side wing was excavated for the existing kitchen. The area on the east side of the Fellowship Hall was excavated, and is now the two rest rooms and class rooms. At the extreme east end underneath the vestibule, a storage room was built. The nursery was formerly located upstairs and had a plate glass window between the nursery and the sanctuary. A public address system was installed in the nursery from the sanctuary. The stairs and rest rooms, at that time, were moved from the west end (cemetery) to their present location. The stairway to the rest rooms were removed. A new steel baptistry was mounted in the sanctuary in its present location. The area downstairs was then a Fellowship Hall, kitchen, rest rooms and class rooms. The tile downstairs was added later. Many of the church family worked their regular jobs. As soon as they finished their regular shift, they would come to the church and work almost everyday until the renovation was completed. Rudolph Leak said, "I can well remember one night while we were nailing the Celotex in the Fellowship Hall ceiling, Eddie Goggans missed the nail and knocked his thumb nail completely off. He bandaged it, and went back to work. Also, there were those who were members of other churches that came to help. I was reminded of what the Bible said about rebuilding the Jerusalem wall: "The wall was rebuilt because the people had a mind to work". As it was in Jerusalem, so it was at the church." At the beginning of the renovations, there was some concern about the foundation strength, since excavation was to take place and pillars to be removed. There was discussion about installing a 12" (Beam in the center of the building running east and west to make certain the foundation was strong enough. A church engineer from Indianapolis, Indiana was called in to show us how to best use the space we had to its best advantage. First, he examined the foundation. After going under the building with a drill and flash light to check the joist, he came out and said, "You don't need an I-Beam -- the joist are yellow 14"x16" yellow pine logs joined together with oak pegs. Put anything you want to on them." After the foundation strength was certified, the work upstairs moved rapidly. The existing entrance located on the south side, near California Street was moved to the center of the building -- forming a Narthex, sometimes called a vestibule. Double doors opening into the center of the sanctuary were installed. New exterior entrance doors were installed on the north and south sides of the Narthex. The purple hammered glass windows in the sanctuary were removed and replaced with stained glass windows. Windows in the east side of the north and south wings were replaced with stained glass windows. A large stained glass picture depicting Christ saying, "Come unto me," was placed in the center of the east end of the Narthex (center front of church). The window is automatically lighted for all who pass, on foot or in automobile, to enjoy. The single stained glass windows in the sanctuary and north wing have a place for a name to be included in memory or in honor of someone. Individuals purchased these windows and dedicated them in memory or in honor of the following people: Mr. & Mrs. G. E. Goggans, Mr. & Mrs. T. G. Ray, Mr. & Mr. N. K. Prather and Harvey Prather, Mr. & Mrs. T. J. Goggans, Ted and James R. Wooley, West Point Manufacturing Company, Mr. William Rozell Goggans, Mr. & Mrs. W. R. Ray, Mr. & Mrs. J. T. and Val Coulter, Mr. & Mrs. J. W. Kilgore, Mr. & Mrs. James A. Christian, and Duke L. Jones. These windows also have a biblical or Christian symbol at the top. Many people have enjoyed these windows. During this period, the steam heating was replaced by a central, natural gas, forced air heating system installed by West Point Manufacturing Co. Service Center, and continues to operate efficiently today. Raymond Scott was in charge of the installation. Automatic switches have since been installed allowing the system to switch from heat to air conditioning automatically. However, the rooms downstairs do not have central heat and air conditioning. Batson-Cook Company moved the steeple, with a huge crane, from the north side of the roof to the center of the new front. While they had the cross in control, Sims Metal Works covered the steeple top and made a copper cross that was mounted on the top. The work was completed without incident or mishap, for which the church gave "Thanks". A new oak pulpit stand, communion table, and two chairs for the Communion table were purchased. The one large and two smaller oak cathedral chairs, estimated to be nearly one hundred years old, were refinished and remain in service today. The table located in the Narthex was formerly the Communion table is also very old. The pews were not replaced with new ones because none could be found as comfortable -- at any price. Herbert Moore of Fairfax, Alabama refinished the benches and H. C. Brazeal made the cushions. The benches and cushions continue to serve in the "House of the Lord'"
When renovations began, the church had a building fund of $7,000.00. When the work was completed, in 1958, expenses totaled some $40,000.00. With thanks to all the labor performed by the church family and their generosity in giving, the church was virtually out of debt. "The church planted, but God gave the increase." While renovations were being done, worship services were held in the River View Theater located next door to the church. On May 12, 1988, the Board voted to install vinyl siding on the exterior of the Parsonage. They also voted to accept a bid by Clarence Hollar to level the Choir room floor and lower ceiling in Pastors' Study. In October the Board voted to install paneling and carpet in the Choir Room and Pastors' Study. Between 1920 and 1923, the great ladies of the church organized a Women's Missionary Society presently known as the Christian Women's Fellowship or "CWF". Through their works, the members, though small, do a great work for the Lord by giving to worthy causes of the Christian Church. The ladies of the First Christian Church play a big part in the work of the church -- mostly behind the scenes and we applaud them for their many accomplishments.